Durango & Silverton Narrow Gauge Railroad trains make their way back to Silverton after an absence of 41 days. 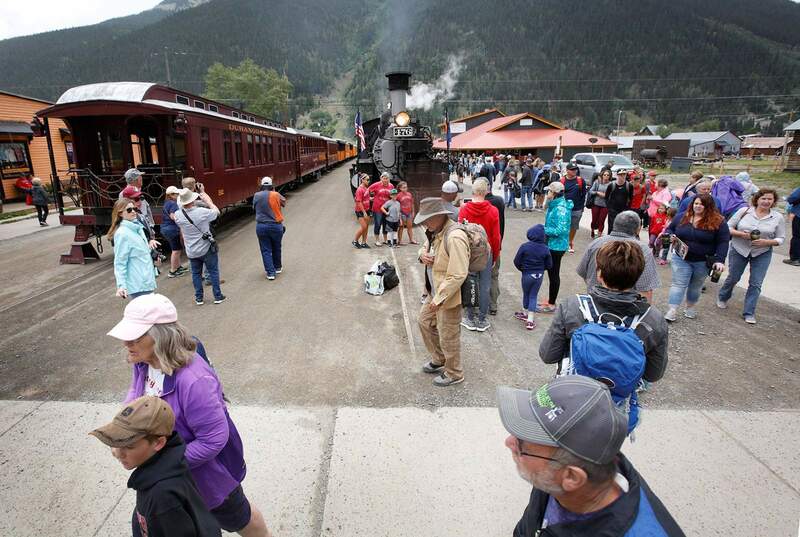 The Durango & Silverton Narrow Gauge Railroad sent two trains and 750 passengers to Silverton on Thursday after county commissioners downgraded to Stage 2 fire restrictions on Wednesday. The train was shut down for 41 days after suspending service when the 416 Fire broke out on June 1. La Plata County had been under Stage 3 fire restrictions, which ban coal-fired engines, since June 12. 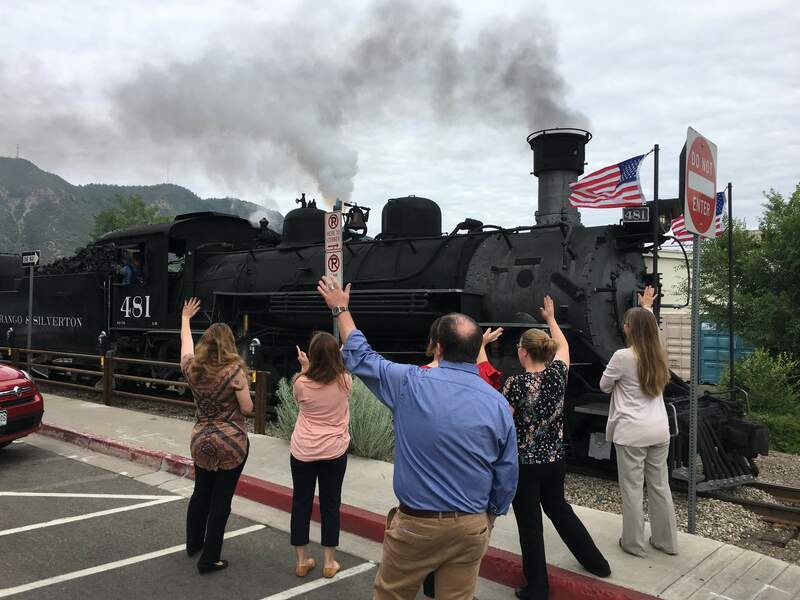 Well-wishers waived at passengers as the coal-fired locomotives blew their whistles and rolled out of the station at 8 a.m. and 8:45 a.m. in Durango. Some residents stopped their workdays to come out of their offices and waive to passengers as the first train made its way through downtown Durango. The railroad ran two trains instead of the usual four on Thursday. However, they utilized more cars on one of the trains and attached another coal-fired locomotive to the front, called a double-header, to get it up steep mountain slopes. Using two locomotives cut the amount of effort the train uses in half, reducing the risk of particulates shooting off, said General Manager John Harper. The train has contracted members of the Durango Fire Protection District to follow the train through subdivisions near the burn area. Patrol crews will also follow the train more closely, and a helicopter will monitor the area. “If there is so much as a spark, we’ll catch it much quicker,” Al Harper said. John Harper said the train is still down 60 percent in sales from last summer. He expects the downward slope to continue through July and August but hopes the word spreads that the train is running and the summer ends on a strong note. “We’re hoping that with our operations back in service, people will start to see that we are open again, we are operating and come back to Durango and really boost our local economy,” John Harper said. The 416 Fire has taken a toll on the local economy, and many residences and businesses are happy to see fire conditions mitigated and the D&SNG return to full service. The town of Silverton, about 50 miles north of Durango, is heavily reliant on the train delivering tens of thousands of passengers every summer. Caleb Ramey, general manager of The Sage Hen Cafe in Silverton, said when the train was in service, the cafe averaged 900 customers a day. In the 41 days without the train, the cafe has averaged six. Ramey said that while Silverton as a whole has suffered from the train’s absence, local businesses on Blaire Street, where the train unloads, have been hit particularly hard. Shirlee Shrum, the owner of Four Paws Pottery and Butterfly Shop, could hardly sleep Wednesday night in excitement for the train returning to town. Shrum had to apply for a loan to make sure her business would survive until next season. Janice Sanders, owner of The Old Arcade Training Co., said sales dropped 90 percent the day after the train stopped coming. Sanders didn’t let any of her employees go during the train’s absence. Instead, she set up a schedule where employees would take an extra day off every week and worked five-hour shifts instead of eight. Greg Brenholdt from Bend, Oregon, was in the area for the Music in the Mountains festival. He had spent summers working for the train and came to the see the train’s departure in support of the railroad. Brenholdt believes the train is one of the most recognizable features in the area. Not everyone who showed up at the train depot Thursday morning was in support of the train. About five protesters showed up at 7:30 a.m. in opposition to the train’s return to service. “We’re sorry it’s not a diesel-burning train and that it’s a coal-burning train because we think coal-burning trains are dangerous to the environment and to the people,” said Judy Kolz. Kolz said there are many members in the community who agree with her. The cause of the 416 Fire remains under investigation, but neighbors who live near the train tracks where the fire started said a cinder from a locomotive started the wildfire, which had grown to more than 52,000 acres. The railroad is holding discussions on how to operate during the 2019 season. It is discussing purchasing two diesel locomotives, but only companies from South America and South Africa make narrow gauge diesel locomotives, which can be expensive. Richard Wilcox and Carolyn Wilcox, a.k.a. Miss Kitty, welcome Durango & Silverton Narrow Gauge Railroad trains to Silverton on Thursday morning. The railroad resumed full passenger service from Durango to Silverton on Thursday after being shut down for 41 days as a result of fire restrictions and the 416 Fire north of Durango. 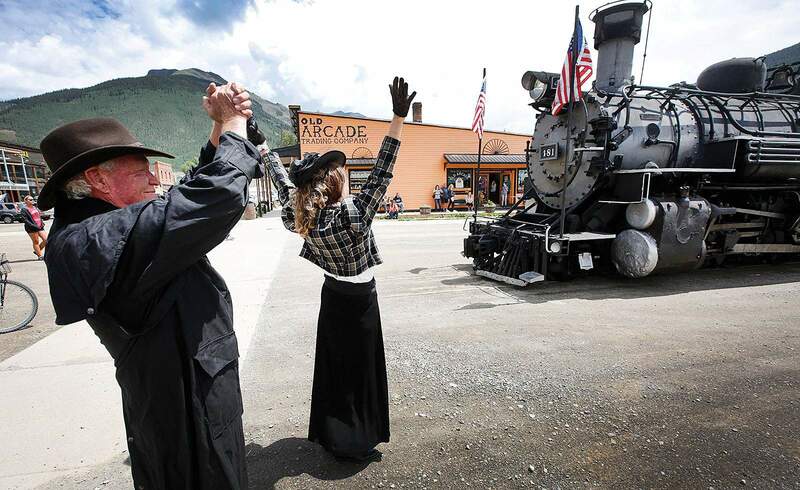 Blair Street in Silverton is again filled with people on Thursday morning after the arrival of two Durango & Silverton Narrow Gauge Railroad trains filled with over a thousand passengers. 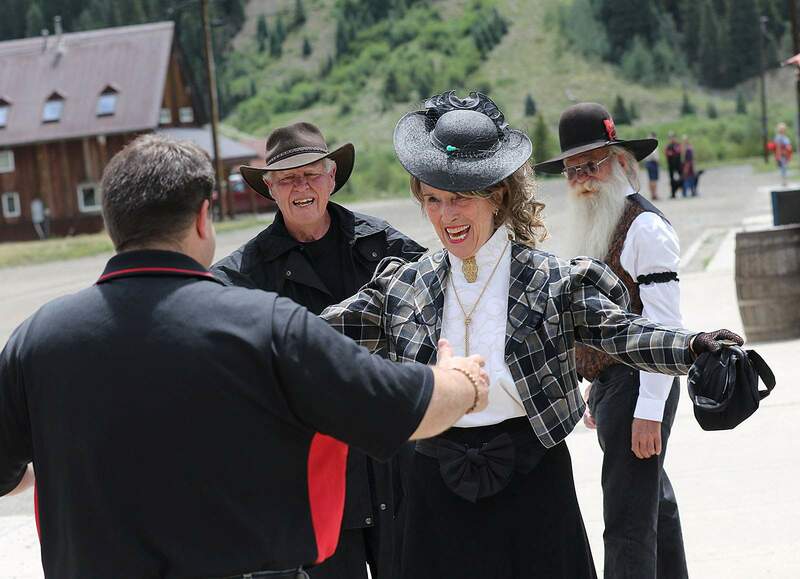 Carolyn Wilcox, aka Miss Kitty, goes to hug Jim Harper, president of American Heritage Railway Hotels, as the first Durango & Silverton Narrow Gauge Railroad train arrives in Silverton on Thursday morning. 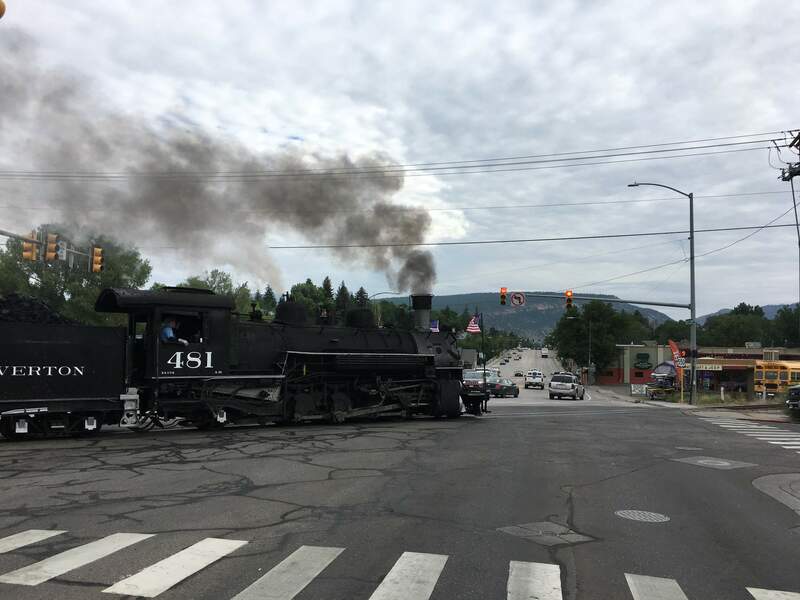 The Durango & Silverton Narrow Gauge Railroad resumed full passenger service from Durango to Silverton on Thursday after being shut down for 41 days as a result of fire restrictions and the 416 Fire north of Durango. The railroad will run two trains Thursday, including a longer-than-usual train that will require two coal-fired locomotives, called a double-header, to get it up the steep mountain slopes.